Y.K. Almoayyed & Sons Electronics & Home Appliances (EHA) division was honored with the 2015 Outstanding Performance Award by COOLEX. The award was presented to Mr. Farouk Yousuf Almoayyed, Chairman of Y.K. Almoayyed & Sons by Mr. Ronny Bittar, Export Sales Manager of Coolex, during his visit on 16th Feb 2016. COOLEX offers complete Central Air Conditioning (CAC) Solutions for residential, commercial and office buildings, medium sized malls and large scale projects. Mr. Farouk Yousuf Almoayyed, Chairman of Y.K. 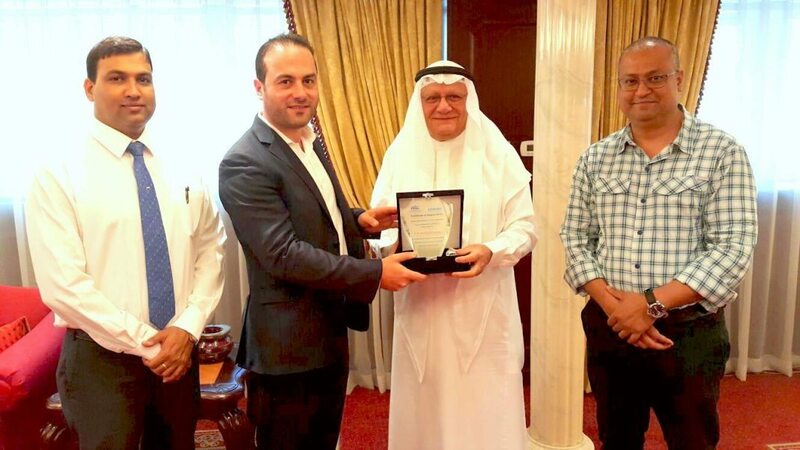 Almoayyed & Sons (2nd from right) holds the “COOLEX Outstanding Award for 2015” that was presented by Mr. Ronny Bittar, Export Sales Manager of Coolex (3rd from right) during his visit to Bahrain. Also present during the ceremony was Mr. Rajesh Gupta, General Manager (1st from right) and Mr. Pradeep Mathias, Projects Department Manager (4th from right), of YKA Electronics & Home Appliances division.